I couldn’t do this sheet because I couldn’t choose! Some of these movies are so different they are difficult to compare. For example, Mulan is my favorite princess, but my favorite music is from The Princess and the Frog. However, my favorite setting is Ratatouille (I mean, Paris). If I took this test several weeks in a row, I’m pretty sure I’d choose a different one each time! But, I will admit, The Lion King has some great music! Oooohhh, I jjuuust can’t wait toooo be kinnnnng! Do you mean how to fill out this one like I did or how to make your own match ups? Gotcha. Just save or copy that first blank bracket and put it in Paint or something similar to type the words on it. Have fun! 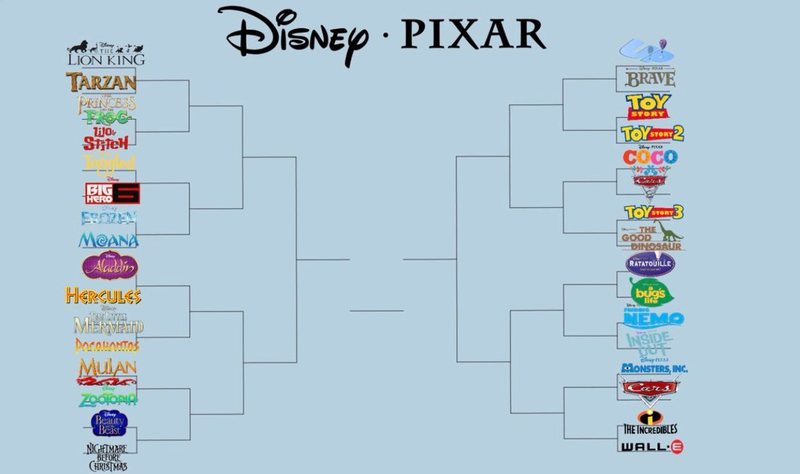 My problem with this is that they pit Moana vs. Frozen again. Why do people love pitting those movies against each other? ?